Find out more about water in our community. The city of Boulder's boulderutilities.net website has an array of water-related information, including the new Consumer Confidence Report (CCR). An in depth analysis of Boulder Reservoir Water Quality by Jim Shelley of the City of Boulder Source Water Protection program. City of Boulder Drinking Water Consumer Confidence Report provides background information on the safety and treatment of local drinking water. What happens to the water that goes down the drain? Within munipalities and selected sewage treatments districts in the Boulder Creek watershed wastewater is collected and delivered to centralized wastewater treatment facilities. The city of Boulder's Wastewater treatment plant is the largest facility in the Boulder Creek watershed and is illustrative of the complex technical and management processes involved in treating domestic and industrial wastewater. Historic Images of Boulder Water Supply taken in the 1920s, including former Boulder Reservoir near Red Rocks and storage dam up Boulder Canyon..
History of Boulder's Water Supply by Robin Ecklund from the Naropa Watershed Atlas. History of irrigation in the Boulder Valley by Anne Dyni provides an historical perspective on how water has influenced-- and been influenced by-- agriculture in the Boulder area. The Boulder Ditch Project examines 150 years of Boulder irrigation infrastucture and its lasting impacts, including historic maps, ditch history, revisiting historic photos by contemptory photographers, artistic interpretation of the lasting impacts of the irrigation infrastructure on local geography, interviews with local ditchriders, and the role of ditches in local ecosystems. Find out about local, state-wide and national issues relating to leaking underground storage tanks and the ways they can pollute groundwater. By Joe Ryan of the University of Colorado. City of Boulder floodplain maps. City of Boulder Urban Forest Report. The Boulder Creek Hydroelectric Flood Wave by Dr. John Moody, USGS. 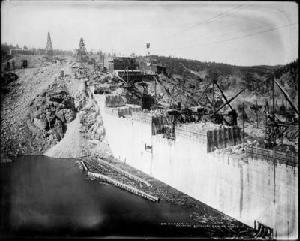 For many years the Public Service Company of Colorado generated peaking power at the Boulder Canyon hydroelectric facility during the evening hours from October to April by releasing water from Barker Reservoir into Boulder Creek, creating an artificial flood wave that traveled down Boulder Canyon. In 1995 & 1996 Dr. John Moody of the USGS Boulder Lab studied this flood wave as an classic example of flood wave propagation. In 2001 the city of Boulder purchased both Barker Reservoir and the Boulder Canyon Hydroelectric Facility and has discontinued regular hydroelectric releases (see Barker Reservoir management plan for more information). Learn more about the city of Boulder's Hydroelectric plants that are built into the water supply system. Beginning in 1859, inhabitants of the Boulder Creek Watershed began developing an intricate system of waterworks-- dams, reservoirs, ditches, pipes and treatment facilities-- to divert runoff from the watershed's natural system and use it for purposes of mining, agriculture, industry and municipal development. By capturing some of the peak runoff in the spring and summer months and storing the water for later in the year, the early water developers significantly changed the character and dynamics of the natural system. One such waterwork was Barker Dam, built in 1909 (see photo above from Denver Public Library collection) by the Public Service Company of Colorado for the generation of alternating current electricity, although not at the dam itself. For more on the hydroelectric systems in the Boulder area, see below. For historic images of the area around Barker Dam before and after the dam was built, visit the BASIN Gallery Near Nederland exhibit. Other important waterworks include the city of Boulder's drinking and waste water systems. While originally much of Boulder's water originated in the high alpine basin near Arapahoe Glacier (now downgraded to a snowfield), today only a portion of the city's water-- around 40% on average-- comes from this protected watershed basin, which is off limits to the public. Photograph copyright by the Denver Public Library. For more information visit the BASIN Gallery.